National Public Lands Day is the nation's largest single-day volunteer event for public lands. In Alaska, with more than 300 million acres of public land, we have a lot to celebrate. In 2016, Public Lands Day will be held on Saturday, Sept. 24. 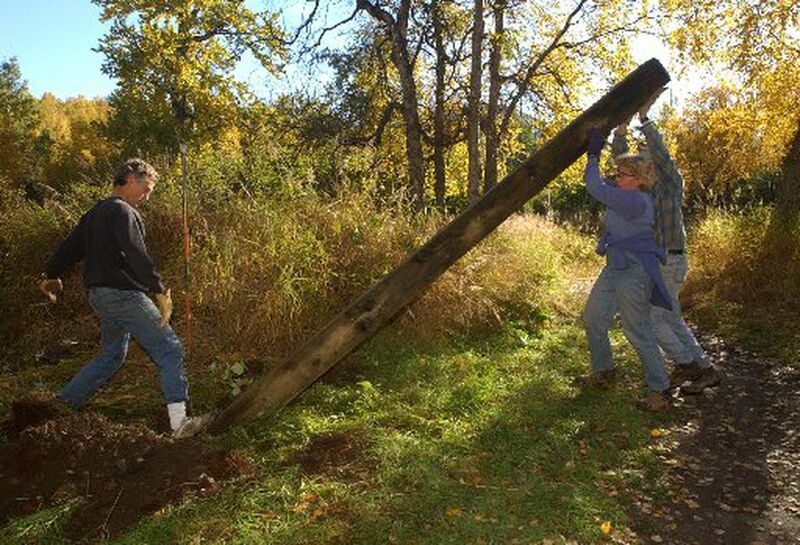 Volunteering on trails is a great way to connect communities to the public lands in their backyard and it gives them a healthy, active way to share in the stewardship of these important areas. More and more children are growing obese and losing their connection to the outdoors. Introducing them to public lands and engaging them in helping maintain them is a great step toward giving them both skills and recreational opportunities. And it's fun. Alaska Trails works to enhance and maintain trails across Alaska. Sustainable trails enable all types of users to access and enjoy public lands while not compromising the integrity and beauty that make the land so unique. This was the first full summer of the Alaska Trail Volunteers program and it has been an enormous success. In partnership with Chugach State Park, Alaska Trails and Alaska Geographic have brought volunteers to the park to address the maintenance backlog on trails. The monthly volunteer events so far this summer have successfully completed a reroute of the Middle Fork Trail. One state employee supervising the volunteers can accomplish more in one day than an entire paid trail crew. This has not only saved the state money in a time of fiscal restraint but, more important, has trained citizens as stewards of their public lands and trails. Alaska Trails is looking forward to the last volunteer work day coming up on Public Lands Day. For a full day of tough, hard and fun work, consider joining the Alaska Trail Volunteers on the Middle Fork Trail of Campbell Creek. The Chugach Trail Volunteers recently finished clearing away years' worth of blown-over trees that were precluding the public's use of Bird Creek Pass Trail. Hikers and trail runners can now connect from Bird Valley to upper Ship Creek Valley with no blocking timber in the way. This type of maintenance had been beyond the state park budget. Activities planned for the celebration at Davis Park in Anchorage include trail maintenance, different wilderness demonstrations, learning more about Alaska's public lands and other recreational activities. Work at Davis Park will begin at 10 a.m. The second half of the day, beginning at noon, will be dedicated to celebrating the public lands and the National Parks Centennial with recreational activities sponsored by Camp Fire and other partners. The Campbell Creek Science Center (CCSC) will celebrate its 20th anniversary in a family-friendly festival-style event from 10 a.m. to 3 p.m., which will include service projects. Many partners have helped with the success of the center over the years and many of them will be returning to lead day-long educational stations or informational booths. Stations will highlight science learning and outdoor skills and will include orienteering, geocaching, a placer mining obstacle course and live birds and mammals. It's fall and rain will be likely on the 24th. Please be a responsible volunteer and come dressed for the weather. Remember to wear work boots and work gloves and to bring a water bottle, food – and a smile. Your work is important to the trails and the great benefits they bring. For more information on any of these volunteer opportunities, please contact Alaska Trails at 334-8049. Steve Cleary is the executive director of Alaska Trails, www.alaska-trails.org.